When we picked up this lamp it had all 4 panels broken, however the 4 drop edges were all intact. The frame holding the shade together was made with flimsy metal. The next photo is a close up of one of the edges which also shows the flimsy tin frame. The panel above this piece has also been removed. As the bottom edges were all intact we photographed each side after numbering each piece as well as marking them to ensure that when rebuilding this lamp that all went back together in it’s original places. 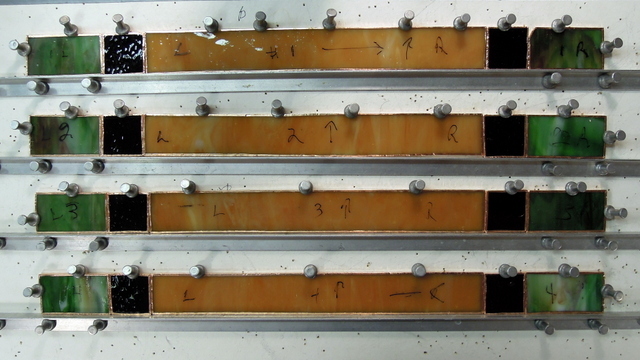 The following photo shows all 4 edges after taken them apart, cleaning, foiling (with Venture Black Backed 7/32 Copper Foil), along with placing the bottom edges on a piece of Morton Layout Blocks to ensure a straight bottom edge. The picture below shows the poor workmanship and the wobbly support stem for the shade. 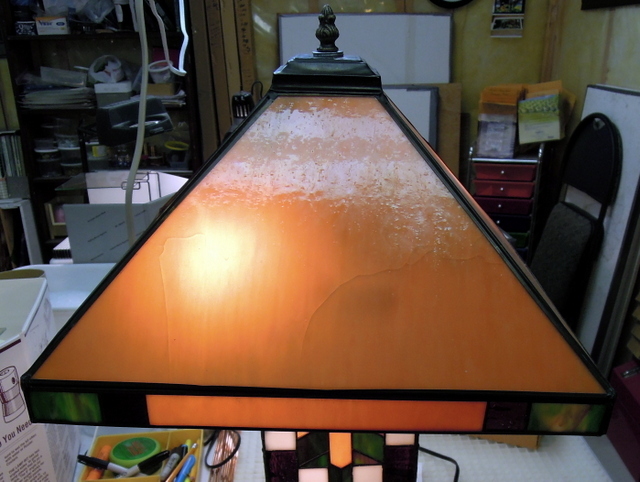 In order to restore this lamp we had to make 4 new panels using Spectrum’s Light Amber Lamp Mix # 318-05S glass. We saved the vase cap and when rebuilding the lampshade we used Venture’s 1/4 inch Black Back Copper Foil. In addition to providing much needed support and long life of the lampshade we installed a 4 way spider. Our client mentioned that the lamp shade was not supported very well, so we put in a longer standard size 3/8 inch threaded brass rod, which together with the spider support and 4 brass nuts 2 top and 2 bottom, plus a washer secured the lampshade to the lamp base in a very strong manner. Another specific reason for the longer brass rod was that the lamp’s light bulbs were very close to the lampshades glass and their heat could have been another factor as to why the lampshade glass cracked. 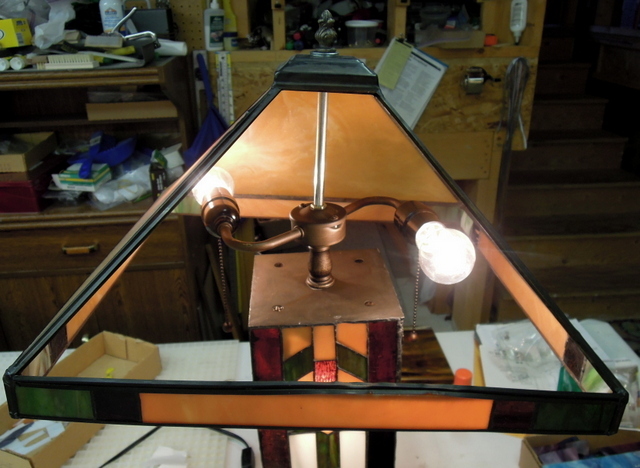 Once the shade was rebuilt, the new solder lines had black patina applied, then the whole unit was cleaned with Kwik Clean and then polished with Clarity Stained Glass Polish. We installed new appliance light bulbs 2 for the lampshade and 1 inside the base stand. 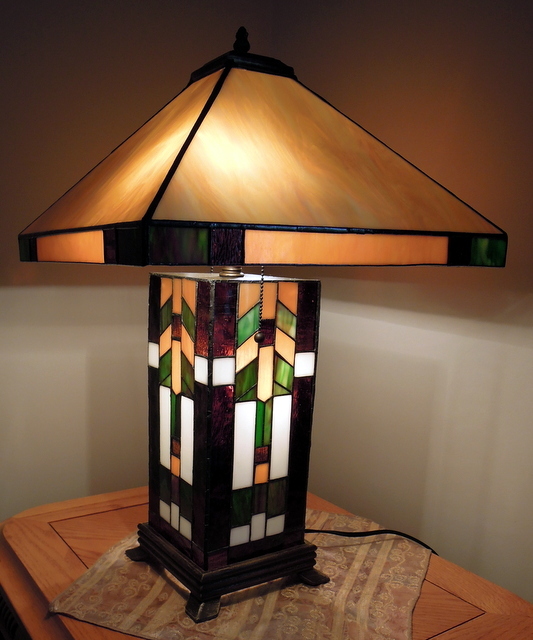 Our client was more than please with the end result and she now has a rebuilt, restored tiffany style lamp that will provide her with years of pleasure. Thank you Bob and Flory! You did an absolutely outstanding job on my lamp! I have it on every night now and it is so lovely. I cant thank you enough for your amazing craftmanship!